They only bad thing I saw was two hive beetles. It amazes me that these things can suddenly appear in a backyard and find an available hive. I squished these two but I’m sure there are probably more lurking around. There is a wild hive in the next door neighbor’s property so maybe they came from there. A healthy hive can handle a small number of these pests so I’m not too worried yet. However, I decided to order a small hive beetle trap to see how they work. I’m also going to spread beneficial nematodes around the hive as the beetle larvae must leave the hive and pupate in the soil to mature. They had also used up almost 100% of the syrup so I went ahead and refilled the top hive feeder with another 96 fluid ounces of simple syrup. I also added a teaspoon of Honey B Healthy to help the girls out. Honey B Healthy uses lemongrass and spearmint essential oils and smells delicious. I have two hives just started as well. Awesome. Did you take Konrad’s course or did you just strike out on your own? Konrad owns Round Rock Honey and offers a beekeeping course in Austin. I’ve heard of the WCABA, but I really didn’t feel like driving up to Georgetown especially after I found Konrad’s class. It is not that far, on 29 maybe a mile from IH-35. The next meeting is tomorrow at 7.00 if you like to come by. 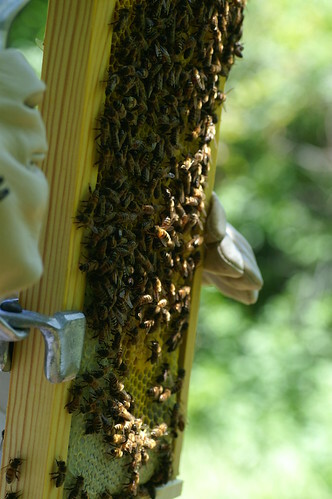 I think one should make all opportunities to meet fellow beekeepers and learn anything one comes across.